Case study on Primark sustainability, ethics, supply chain. Are Primark's sustainability efforts enough to make a difference? Primark, the Irish fashion retailer owned by Associated British Foods (ABF), is seen as one biggest fashion retail success stories of the past decade. Best known for its low price and high value offering, "Amazing fashion, amazing prices", the high street staple has extended its reach across Europe and overseas into the United States. However, in spite of its retail success, Primark has been struggling to overcome the consumer’s pre-fixed notion that fast-fashion is not sustainable, and certainly not ethically made. Following the tragic collapse of Rana Plaza, the most deadly accident in the history of the garment industry, more and more people begun to question how a t-shirt costing as little as 2 pounds could ever be responsibly made. 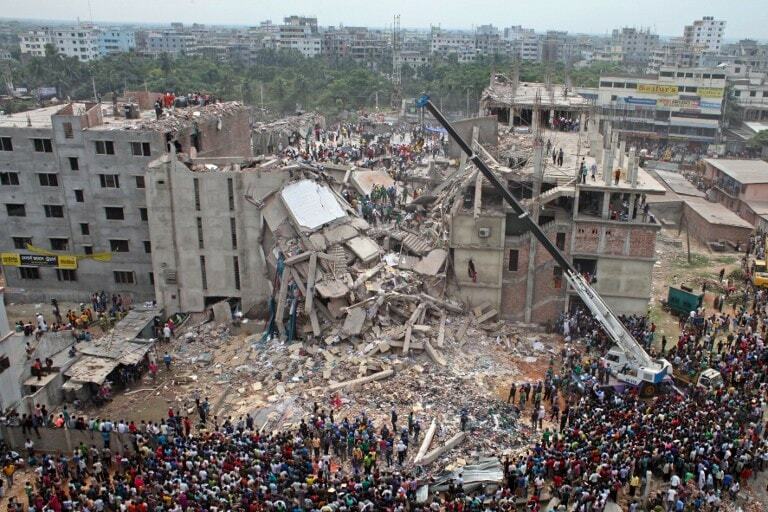 On April 24, 2013 a building housing five garment factories which manufactured products for approximately 28 brands, collapsed in near Dhaka, Bangladesh, claiming the lives of 1,138 workers and injuring more than 2,000 individuals. The tragedy was not only seen as a wake up call for the international fashion industry to band together and protect those most vulnerable in their supply chains - it was also a immediate call to action for Primark, who sourced from New Waves Bottoms, a supplier in Rana Plaza, to take a closer look at its ethics and CSR, to see where it could improve. Primark was among the first retailers to sign the Accord on Fire and Building Safety in Bangladesh, initiated by the IndustriALL and UNI Global Union. It was also one of the first to ensure the factory victims and families affected by the collapse receive financial support and food aid immediately following the disaster. The value retailer pledged to give both short and long-term financial compensation to those affected by the factory collapse and has paid a total of 14 million dollars to date - 11 million of which has gone to workers and families employed by its supplier, New Waves Bottom. Since then Primark has continued to work with local partners and non-profit organisations to ensure any funds or support they gave to workers and their families would be secure by offering financial advice and guidance. In addition, the Irish retailer launched the ‘Pashe Achi Project’ to ensure compensation recipients retain access to their financial compensation and understand their rights. This short film shows Primark’s work with local organisations to support the workers and families of New Wave Bottoms, the factory making garments for Primark in the collapsed Rana Plaza building following the payment of long term compensation. Lastly, Primark also tighten its programme of structural surveys in Bangladesh to assess the structural integrity of the factories from which it sources from. At the moment Primark has a team of over 80 experts dedicated to sustainability, ethical fashion and worker training as part of their Ethical Trade Team. These teams based in its nine key sourcing locations, such as China, India, Bangladesh and Turkey, act as the retailer's "eyes and ears on the ground," according to Katharine Stewart, Primark’s Director of Ethical Trade & Environmental Sustainability. Primark regularly visits factories where it holds a ‘lead’ role in respect to the Accord and is in frequent contact with all other factories which it supplies from. But Primark’s ethical and sustainable initiatives go much further than Rana Plaza. Unlike fast-fashion competitors, such as H&M, who has been extremely open in communicating their sustainable initiatives to the public through campaigns such as ‘Close the Loop’, Primark has remained relatively quiet on what it does in terms of sustainability, ethics, and labour rights. Until recently that is. Following the expansion of its Sustainable Cotton Programme, which sees Primark working with CottonConnect and the Self-Employed Women’s Association (SEWA) to support over 11,000 female cotton farmers in India, as well as increasing consumer interest in Primark’s own sustainable and ethical practices, Primark has decided to become more vocal concerning its commitments to producing responsible fashion. “Historically when we did not say anything, people believed that we were not being sustainable at all, when we were just trying to find our comfort level in communicating this,” explains Stewart. “It’s not something new, it’s business as usual and we have been doing it for a very long time. But now our customers are asking us about it, so we are talking about it more...especially now that our customers are getting older, they want to know more.” Over the years Primark has implemented a series of strategies and initiatives which vary from improving the livelihoods of its garment workers, to reducing its carbon footprint as well its chemical usage, water usage and waste output, to using more sustainable materials. But is Primark doing enough? FashionUnited shares its findings in its first long-form story looking into the value retailer’s sustainability and ethical initiatives. This in-depth case study on Primark’s social and sustainable efforts aims to highlight the complexity and the difficulties faced in bringing around systemic change within the global fashion industry. It also underlines the opposing opinions on whether sustainability and fast-fashion can ever go hand-in-hand. Primark is a major retail group. Founded in Ireland in 1969 under the name Penney’s. It operates stores in the UK, Republic of Ireland, Spain, Portugal, Germany, the Netherlands, Belgium, Austria, France, Italy and the US, directly employing 68,000 people. As of FY2016 it operated 325 stores in 11 countries - Primark does not have an online store. Primark offers customers quality, up-to-the-minute fashion at value-for-money prices. Primark’s expansive product range includes womenswear, lingerie, childrenswear, menswear, footwear, accessories, beauty, hosiery and homeware. Primark’s buying and merchandising teams in Dublin (Republic of Ireland) and Reading (UK) travel internationally to source and buy fashion items that best reflect each season’s key fashion trends. Photo: Katharine Stewart, Primark’s Director of Ethical Trade & Environmental Sustainability. Credit: Primark. Milan, Italy Primark store photo. Credit: Primark. Milan, Italy Primark in-store photo. Credit: Primark. What impact does Primark’s Code of Conduct really have? One of Associated British Food’s five pillars of corporate responsibility is based on improving and strengthening its supply chain. This includes protecting its most vulnerable pieces - namely its garment workers and ensuring their rights are upheld in each country it produces in. Which is why Primark joined the Ethical Trading Initiative (ETI) 1 in 2006, and became a leader in 2011. The value fashion retailer remains dedicated to working with other retailers, NGOs, trade unions and organisations across the industry to improve the lives of the people working within the garment industry’s emerging markets. Even before the Rana Plaza factory collapse, one of Primark’s main points of focus looked to improve safety standards and worker wellbeing for all its employees around the world. Primark operates using a common set of global standards in all its sourcing hubs, known as its Code of Conduct 2. This set of guiding principles is based on the internationally recognised labour standards from the International Labour Organization (ILO) Conventions 3 and the ETI’s Base Code. Primark’s Code of Conduct lays out the core principles their suppliers and their factories must adhere to when it comes to working conditions, such as working hours, fair wages and workers’ rights in order to do business with them. In addition, Primark also works with the ILO Better Work Programme 4 in countries such as Vietnam, which aims to help factories meet and uphold international working standards. But just how reliable is Primark’s Code of Conduct? “Primark’s Code is much in line with Fair Wear Foundation Code of Labour Practices,” points out Lotte Schuurman, Communications Officer at the Fair Wear Foundation 5 (FWF). Primark shares a number of core principles within its Code of Conduct with the Fair Wear Foundation Code. For example, each Code states employment must be freely chosen, no child labour, and the freedom to form and join trade unions - all standards derived from the United Nations Declaration on Human Rights 6. Ensuring suppliers and their factories uphold Primark’s Code of Conduct is where the retailer’s Ethical Trade Team comes in. Previously consisting of only two people in 2007, Primark’s current 75 member Ethical Trade Team is of vital importance when it comes to monitoring supplier factory standards and addressing any issues concerning worker rights. The Ethical Trade Teams work in Primark’s main sourcing locations, such as China, India and Bangladesh, and consist of trained experts like civil engineers, as well as local people who speak the language and understand local norms and context. “We are always concerned about workers needs and rights within our supply chain. Part of the programme we have in place now is what you call due diligence, and it is all about audits,” says Katharine Stewart, Primark’s Director of Ethical Trade & Environmental Sustainability. The value retailer makes sure each supplier it works with has a full formal audit once a year, which is carried out by Primark’s own team or approved external auditors. These audits, which can be announced before hand or not, include confidential worker interviews. This is of vital importance in countries such as India, Bangladesh and Pakistan where women make up 80 percent of the workforce. Female garment workers often face numerous issues such as sexual harassment, threats of violence and prejudice within the workplace. In a factory setting, where the management team usually male dominated, female workers can be pressured to work overtime without pay to reach production targets, or denied the right to maternity or sick leave. Without confidential worker interviews, many of these workers who fear losing their jobs - usually their only means of an income - may never share their real working experience with suppliers clients. However Primark does not tackle it’s factory audits alone. It’s own in-house teams are supported by independent, third-party auditing companies, which are said to be “critical” to ensuring Primark upholds its monitoring standards. “We pay for all our audits ourselves as well,” adds Stewart. “Our reason for doing so is to control and retain the integrity of them.” Usually suppliers contact an external party of their own choosing when conducting a factory audit. By paying for their own audit Primark is able to ensure the integrity of the audit is not influenced by any external factors and gain a clear picture of actual working conditions. continues to develop, from the perspective of the manufacturers and the workers involved. How transparent is Primark’s supply chain? For example, if an audit finds that factory workers are working more than the allowed overtime per week, Primark will work together with the factory managers to create a more flexible schedule, giving workers less overtime. Primark will then follow up with the factory in question at a later date, either through a pre-announced check or a spot-check, to ensure the issues have been handled effectively. “We try to be proactive and helpful partners when it comes to audits,” points out Stewart. “Some factories need help improving certain areas, so we make sure we work together with them by explaining the implications and solutions on the audit checklist.” Primark also runs an online supplier management system which offers training programmes on how suppliers can improve their working standards. However, despite of all its initiatives aimed at modern slavery issues, Primark is still regularly accused of sourcing from sweatshops and forced labour camps. For example, back in 2014 and 2015 British shoppers are said to have found letters and hand stitched labels in garments pleading for help, which aimed to raise awareness for the terrible conditions workers were apparently forced to endure. After reaching out to the shoppers who found these letters and labels and conducting its own research, Primark claimed the distress calls were all part of an elaborate hoax looking to sully its name. The Ethical Trading Initiative (ETI) is a leading alliance of companies, trade unions and NGOs which promotes respect for workers' rights across the globe. Primark’s Code of Conduct incorporates the United Nations Charter, Chapter IX, article 55 and all suppliers of products to Primark must agree to follow the Code of Conduct. International Labour Organization (ILO) brings together governments, employers and workers representatives of 187 member States, to set labour standards, develop policies and devise programmes promoting decent work for all women and men. The Better Work Programme is a partnership between the International Labour Organization (ILO) and the International Finance Corporation (IFC)which aims to improve labour standards and competitiveness in global supply chains. The Fair Wear Foundation works with brands, factories, trade unions, NGOs and sometimes governments to verify and improve workplace conditions in 11 production countries in Asia, Europe and Africa. FWF keeps track of the improvements made by the companies it works with. The Universal Declaration of Human Rights (UDHR) is a milestone document in the history of human rights. Created by representatives with different legal and cultural backgrounds from all regions of the world, the Declaration was proclaimed by the United Nations General Assembly in Paris on 10 December 1948 as a common standard of achievements for all peoples and all nations. Clean Clothes Campaign (CCC) is a global alliance of trade unions and NGOs. The CCC works together with numerous partners across the world to improve working conditions and the empowerment of workers in the textile and apparel industry. Project JUST is an open platform dedicated to informing and empowering consumers have the power to transform the fashion industry to an ethical and sustainable one with each purchase. The Bangladesh Accord on Fire and Building Safety in Bangladesh (the Accord) is a five year independent, legally binding agreement between global brands and retailers and trade unions designed to build a safe and healthy Bangladeshi Ready Made Garment (RMG) Industry. Association for Stimulating Know How (ASK)is a capacity building, self-supporting, voluntary organisation working nation-wide across India, as well as Internationally to promote the best interests of marginalized groups and societies. The 2017 Corporate Human Rights Benchmarkassesses 98 of the largest publicly traded companies in the world on 100 human rights indicators. Department for International Development leads the UK’s work to end extreme poverty, tackling global challenges such as disease, mass migration and poverty. Bangladesh posters: These posters were created in conjunction with workers, with support from SHEVA NARI O SHISHU KALLYAN KENDRA. Copyright Primark Stores LTD 2012. Photo: Workers sewing in Indian Garment Factory. Another pillar from ABF’s five pillars of corporate responsibility focuses on enhancing the lives of its workers. One of Primark’s long-term goals is to source all of its cotton more sustainably, which is why one of its most recent initiatives, and perhaps its most impactful to date, sees Primark working directly with female cotton farmers in India to improve the quality of cotton grown, while enhancing their livelihoods. Primark’s sustainability cotton programme in India is a solid example of how a high street retailer can work together with local communities to make a positive change. At the moment Primark does not purchase any raw cotton directly from farmers, as it does not directly own any mills or factories. Nevertheless cotton, a natural fibre, makes up a large percentage of its apparel range, even though it remains a labour and resource intensive product. Although it is grown on large-scale industrial farms in certain regions, in most cases the cotton used to make textiles and apparel comes from small farms in low-income countries, such as India, China and Pakistan. In these regions a lot of the knowledge concerning the best practices for growing cotton, as well as the most environmental friendly tactics available to do so, tends to be rather limited. Which is why Primark decided to partner with agriculture experts, CottonConnect 1, and the Self-Employed Women’s Association to launch the Sustainable Cotton pilot Programme in 2013. “The reason we started our Sustainable Cotton Pilot programme four years ago is because cotton is one of the main fibres we use in our products, and we wanted to achieve greater visibility in our cotton supply chain to better understand how it works,” says Katherine Stewart, Primark’s Director of Ethical Trade & Environmental Sustainability. “We wanted to develop a deeper understanding concerning the manufacturing processes behind cotton.” The programme was originally designed to introduce sustainable farming methods, improve cotton yields and increase the cotton farmers income. At the same time Primark decided to exclusively work with female cotton farmers in Gujarat, Northern India during the pilot because they realised many other cotton initiatives lacked gender focus. India currently ranks 130 out of 188 countries in the UN’s Gender Inequality Index, as gender equality is seen as one of the most pressing development challenges facing the country. Hover your mouse over the photos to learn more. Average farmer profit increased 247 percent during its third year. Water usage was decreased by 10 percent. “The reported results show that working with farmers at this level can have a number of positive impacts on yields, chemical and water use reduction and increased income,” says Jacinta FitzGerald, Head of Research at Project JUST 2. “Considering that the majority of Primark’s products are made from cotton, we would suggest the brand dramatically increase its initiatives in this area by supporting similar programmes to achieve 100 percent sustainably grown cotton.” In fact, the results of the cotton pilot programme were so successful they exceeded all Primark's expectations, which is why the value retailer has expanded the programme to support an additional 10,000 farmers in Gujarat over the next six years. Primark has already begun to train 5,000 new cotton farmers and plans to scale this up in time. This short film follows the impact Primark's Sustainable Cotton Programme has had on female farmers in Northern India and includes interviews with some of the women involved. “We always knew that we wanted to scale it up - which is why our initial pilot group was so large.” The large size of the pilot gave Primark a solid grasp of what effect the programme would have on the lives of the small-scale female cotton farmers and helped them work out any issues they may have. “The key thing to take away from the pilot, apart from the fact than the average income has increased exponentially, is that the farmers have become financially independent,” stresses Stewart. “They’ve been able to purchase equipment, such as tractors, things they would have normally have had to rent out. And not only are they buying their own equipment, they are also renting it out to their neighbours as well.” Others have even built their own cotton storage facilities on-site to manage their own cotton sales. However, this boost in income also brought on a new set of concerns for the female cotton farmers who participate in the pilot, as they were not used to managing a large cash flow. “So now we have implemented our Farmer Field School to help them manage their own income and run their own businesses.” By offering these female farmers advice and guidance on how they can best manage their income and oversee their cash flow, Primark aims to ensure the cotton workers become financially independent. For Stewart, the community impact of the programme and the knowledge the farmers have gained thanks to the programme has been the most rewarding to witness. “It’s a ripple effect and quite incredible to see, because they may have a neighbour who grows cumin and now are able to share knowledge on which chemical or natural pesticides are best to use. For me, it’s really all about education. Because if you give someone an education, it stays with them and that’s sustainable.” She stressed that the cotton project focuses on giving farmers a hand up, not a hand down in the form of free seeds, or pesticides or equipment. In addition the Farmers Field School has made Primark realise how important education truly is for farmers and what impact it can have on their lives. Primark has published the results of their sustainable cotton programme on their website, as well as personal stories from the farmers themselves, but Stewart admits the company is still learning on how to take what they have learned from the pilot all the way through to end production to bring it to scale. “It’s still early days, but it’s going very well...the whole process is a journey of understanding. But now that we have a formula that we know works, we can start to look at how we can do that in different locations.” For now Primark has chosen to localise their efforts in Northern India, but it has not ruled out expanding the programme to other countries. “One of our long-term goals is to source all of our cotton more sustainably,” says Stewart. However, Primark’s sustainable cotton programme is not its only initiative in place aimed at empowering and educating its female garment workers. For example, one initiative started by Primark together with Health Enables Returns 3 (HERHealth) and Business for Social Responsibility (BSR) in China, India, Bangladesh and Myanmar aims to educate female garment workers on their health needs and support them in learning. To date over 800 female workers have been coached and they in turn have taught more than 20,000 women. Another programme that Primark has had in place since 2009, focuses on enriching the lives of its workers, and sees the value retailer working together with Social Awareness and Voluntary Education 4 (SAVE) to educate its workers in Southern India. The programme helps raise awareness on a wide range of topics, such as the importance of children's education, financial planning, general health and workers rights through the formation of worker education groups. In total 6,279 workers in 436 groups have been trained through the programme since 2009, which has impacted the lives of approximately 30,000 garment workers. This short film shows how Primark's programme in Bangladesh has help provide essential health, hygiene and nutritional education for garment workers. But how sustainable is Primark’s sourced cotton? However, although Primark has heavily invested in improving the livelihoods of these female cotton farmers, some wonder what other initiatives Primark has taken to ensure the rest of the cotton it uses is as ethical and sustainably sourced. For example, Primark previously sold organic cotton products in the past, but no longer does so. The value retailer claims it aims on selling organic and Fairtrade cotton products in the future, but that it depends on market demand - thereby leaving it up to their customers to ask for it. Unlike cotton from Primark’s sustainable cotton programme, organic cotton is grown without the use of chemical pesticides and fertilisers which reduces the potential negative impact of cotton production on the local environment. In addition, the fashion retailer received the worst score on the Ethical Consumer 5 rating, an independent public consumer rating, for its cotton supply chain. Primark previously signed the Responsible Sourcing Network’s Cotton Pledge 6, and in doing so committed to not knowingly source any cotton from Uzbekistan 7 - one of the world’s largest exporters of cotton - for the manufacturing of its products. However, the Government of Uzbekistan forces more than a million people 8 to work in the cotton fields each harvesting season and numerous reports highlight cases of human rights violations and forced child labour are “rife”in Uzbek cotton production. Although Primark has pledged not to knowingly source cotton from Uzbekistan, it does not seem to have any secure policy in place to guarantee it is not sourcing cotton from there, raising concerns about traceability and transparency within Primark’s supply chain once more. As a leading member of ETI, Primark’s Code of Conduct is founded on the ETI Base Code which stresses that “wages and benefits paid for a standard working week meet, at a minimum, national legal standards or industry benchmarks, whichever is higher. In any event, wages should always be enough to meet basic needs and to provide some discretionary income.” Primark states it requires all its suppliers to adhere to this definition for all workers within its supply chain. For the value retailer, a living wage is seen as one which includes the total cost of living, healthcare, food, education and housing. Primark adds that it does acknowledge the inherent challenges in defining and calculating a living wage, but it believes that a “negotiated approach” remains the most practical and sustainable move and supports the development of all industrial strides taken to achieve this. For example, Primark is a founding member of Action, Collaboration, Transformation (ACT) 9, an initiative consisting of other retailers, manufacturers and trade union IndustriALL which aims to improve wages by establishing an industry collective bargaining power in key sourcing countries such as Cambodia and Bangladesh. ACT aims to uphold world class manufacturing standards as well as responsible purchasing practices. Primark stresses that its programmes aim to help its workers have better livelihoods. At the moment Primark is developing a holistic strategy aimed at improving wages, which includes country-specific approaches. The strategy aims to build on its current pilot programmes while building on key areas of focus, such as factory improvements, worker empowerment and benchmarking supplier performance. Another key initiative to help its workers manage their finances sees Primark partnered with banking service Geosansar 10 in India. Acting as an agent and intermediary between banks and customers, Geosansar and Primark have aided workers in opening a bank account for the first time. In order to ensure garment workers can have easy access to their bank accounts, Geosansar bank kiosks are located close to factories and worker communities. The partnership, which sees Primark and Geosansar also provide financial education, as well as access to banking, has helped over 400 workers. This short film shows how Primark's partnership with Geosansar helps garment workers open a bank account for the first time, while offering financial education as well as easy access to banking. But is Primark doing enough to boost wages for garment workers? While Primark’s work does show that the retailer is committed to improving wages for its garment workers, the value retailer seems to be stuck at the strategy level and research stage and has yet to begin developing long term building blocks to paying livable wages. For example, Cambodia was the first country in which the ACT initiative began its first process to develop an industry-wide collective bargaining for higher wages. In September 2015, an ACT delegation, which consisted of IndustriALL and leading representatives from Primark, H&M and Inditex travelled to Cambodia to meet with suppliers, garment unions, the Labour Ministry and the Ministry of Commerce and the garment manufacturers association of Cambodia. However, since then there have been no further updates or concrete outcomes on record of what exactly has been done to date. “Work is in the early stages,” notes Stewart, so it has yet to be seen what, if any achievable impact, the initiative has on the wages of garment workers. Cotton Connect is an enterprise which aims to transform the cotton industry for good, working with brands and retailers to enable them to develop a more robust and resilient cotton supply chain. Project JUST is an open platform dedicated to informing and empowering consumers to have the power to transform the fashion industry to an ethical and sustainable one with each purchase they make. HERHealth is part of HERProject, an initiative from the BSR which aims to increase the ability of low-income women to take charge of their health. Social Awareness and Voluntary Education is an NGO which aims to tackle child labour practices and empower female garment workers. The Ethical Consumer is an independent, not-for-profit, multi-stakeholder co-operative with open membership, which provides tools and resources to consumers to make informed purchase choices. End Uzbek Cotton Crimes is one of many organisations trying to raise awareness for the humantarian issues at work within Uzbekistan cotton production. According to the Cotton Campaign the Uzbek and Turkmen governments force farmers to grow cotton and citizens to pick cotton, all under threat of penalty, including the loss of land, job loss, expulsion from school, and docked pay. In Uzbekistan, more than a million school teachers, doctors, nurses and other citizens are victims of forced labor each year. Action, Collaboration, Transformation (ACT) is an initiative between international brands and retailers, manufacturers, and trade unions to address the issue of living wages in the textile and garment supply chain. Geosansar offers financial education and services to the those without a bank India. Supported by the State Bank of India, Geosansar provides bank accounts and bank branches in worker communities. Photos: Primark Sustainable Cotton Programme. Credit: Primark. Infographic Living Wage: Clean Clothes Campaign, Tailored wages report 2014. Outside of its sustainable cotton programme, Primark has been working hard on what good guidance looks like and is searching for ways to decrease its overall water usage, chemical usage, waste production to help protect the environment. As part of one ABF’s five pillars of corporate responsibility - looking after the environment - manufacturing its products with as little harm as possible to the environment remains one of the Primark’s key sustainability goals. “Primark is committed to reducing the impact of our operations on the environment and has implemented a number of sustainability initiatives across the business, including environmental health and safety audits, energy audits, central building management system to optimize energy consumption, LED lighting, extensive employee training, extended producer responsibility measures and waste recycling programmes,” explains Katharine Stewart, Primark’s Director of Ethical Trade & Environmental Sustainability. For example, Primark has a team of specialist auditors who conduct audits in all of its stores across 11 countries. The team works together to make sure each location is fully compliant with the regulatory requirements and that the value retailer continues to meet accepted good practices within the retail industry. The audits include onsite waste management practices, review of store emissions and ensuring all equipment is properly maintained. In addition Primark has also achieved the Carbon Trust Standard for Waste for its waste management systems in store and is working to assume direct control over as much of its recyclable materials used during packing and transport as possible. For example, Primark established a resource recovery unit in its German depot centre in July 2015, where cardboard, plastic and hangers are collected from its Northern European stores to be reprocessed and sent for recycling. The value retailer has had a similar system in place in the UK for a number of years now, which ensures all recyclables are collected from its stores via its delivery trucks and transported back to the central distribution centre. As Primark has become more actively involved in the recycling process of its materials, it has been able to significantly reduce the volume and frequency of waste collections at each store and aims to expand this system to additional regions. “Last financial year, 94 percent of waste generated by all of Primark’s stores and warehouses was recycled or beneficially reused,” points out Stewart. But what about Primark’s Greenhouse Gas Emissions? Although its high energy is often cited as another reason as to why the fashion industry is seen as one of the most polluting in the world, there is another factor which contributes to this picture. The purchase and use of clothing is said to contribute approximately 3 percent of the global production of C02 emissions, over 850 million tonnes a year according to the Carbon Trust. And Primark’s fast-fashion system makes it one of the larger contributors to the problem. The value retailer has been working hard to ensure its energy usage is as low as possible and reduce its store and warehouse waste, but it has yet to fully tackle its greenhouse gas emissions (GHG), one of the biggest contributors to climate change. According to Associated British Foods Corporate Responsibility Report for 2016 2, Primark’s GHG emissions have increased by 15 percent over the last three years. Primark’s GHG emissions grew 3 percent alone last year, as the value retailer attributes this growth to its expanding network of stores across Europe and the United States, leading to more transport movements of its products. At the moment 57 percent of all Primark’s GHG emissions result from the transporting of its goods and as Primark continues to grow, this percentage is only likely to increase. Primark notes it is constantly reviewing its routes, type of vehicles used and shared services to ensure it minimise miles and the resultant emissions as the company expands. But the value fashion retailer has yet to explore alternative solutions or set itself fixed goals in reducing its greenhouse gas emissions. Launched in 2014, the ‘Love Your Clothes campaign’ has been developed together with industry organisations to help change the way the UK consumers buy, use and dispose of their clothing. Their ultimate aim is to reduce the environmental impact of clothing across the UK and influence a more circular approach to clothing globally. This short film shows how I:CO works with retailers to initiate clothing recycling drives in store, and encourages consumers to be more mindful with their unwanted textiles. Next to its textile and garment recycling initiative, Primark has been working with two organisations to efficiently manage its textile waste while helping those in need. “The one in the UK, which covers all our European stores, is Newlife 8, a foundation which supports children who are either terminally ill or very physical disabled,” explains Stewart. “All the stock we have in store which we can’t sell, all our buying office samples and excess stock, is donated to Newlife.” Primark first started working with Newlife in 2010, and since then has managed to generate more than 2 million pounds in donations, which has been used to purchase equipment such as wheelchairs, nurse services and fund medical research. “In the States we set up a similar model with an organisation called KIDS Fashion Delivers 9.” All of Primark’s stores in the US have been donating their excess stock to the non-profit organisation since 2015, which goes to those in need in 50 states throughout America. In addition Primark’s European stores donated a total of 100,000 cartons apparel goods to the European Red Cross Refugee Appeal 10 in 2015 to help refugees and migrants. Is Primark doing enough in terms of sustainability with its excess stock? Primark’s charity efforts show the value fashion retailer has its heart in the right place, but some worry that its garment recycling initiative is not enough to tackle the problems at hand, as there are alternative ways to handle excess stock. “Primark could explore the concept of demand planning, having systems in place to understand and gauge the demand of a particular item, and then only produce to meet that demand, rather than over producing and creating surplus stock,” points out FitzGerald. “We know that this is possible, as other brands work this way. Making items in lower quantities so that they sell out and making them more exclusive, will reduce the need for Primark to explore donating its unwanted items.” Another issue concerning Primark’s apparel donations revolves around the quality of its garments. Some NGOs and charities have even raised concerns with donating second hand or even unworn clothing from Primark due to their poor quality - a trait which is often associated garments made quickly out of synthetic fibres and polyester/cotton blends. Outside of energy, waste and water management, Primark has also begun to look further down the supply chain on how it can help fabric mills decrease their chemical usage. This way the value retailer can manage its chemical usage before the material even arrives at garment factories. Part of Primark’s chemical management requirements includes two restricted substance lists 12 - Product Restricted Substance List (PRSL) and a Manufacturing Restricted Substance List (MRSL), which detail the limits for chemicals usage in the materials used to make its products, including dyeing and washing. In 2014 Primark signed up to Greenpeace’s Global Detox Campaign 13 and committed to phase out the use of certain harmful chemicals by 2020. In 2015 the value fashion retailer was recognised as a Detox leader by Greenpeace and joined the Sustainable Apparel Coalition (SAC) 14, committing to use SAC’s sustainability tool, the Higg Index, to help drive sustainable improvements across its supply chain. Apart from joining SAC and the Greenpeace Detox Campaign, Primark also joined the initiative Zero Discharge of Hazardous Chemicals (ZDHC) 15 together with 22 global apparel retailers. Together the group has created a list of restricted manufacturing substances, developed audit protocol tools and waste-water quality guidance and are in the process of creating a common training tool on chemical management. By encouraging mills to use less chemicals in the dyeing or processing of the fabrics, Primark is driving sustainable change further down the supply chain to lead to sectoral change. However, in spite of the numerous initiatives Primark has undertaken to combat its chemical usage, the value retailer may not be able to reach its Detox commitment to Greenpeace by 2020. “Please note, Greenpeace no longer recognized Primark as a Detox Leader,” says FitzGerald. “The most recent report released in July 2016, ranks Primark in ‘Evolution Mode’, with Greenpeace stating that although the brand performs well on the elimination of perfluorinated chemicals (PFCs) and transparency, it fails to take individual responsibility for the main tools it needs to meet its Detox 2020 plan.” The report notes that Primark chooses to rely on the ZDHC’s “flawed methodology”, which means the retailer is not selecting new target chemicals for eradication, or ensuring when it does test for their elimination, it is as close to possible to ‘zero.’ Greenpeace encourages Primark to adopt a “clean factory” approach, which sees chemical elimination targets applied to suppliers entire factory floor and not just to Primark’s own production lines. “Additionally, other fast fashion brands are researching circularity, where used garments can be returned to the brand, the garment broken down (either mechanically or chemically) and respun into new yarn, then made into a new garment,” adds FitzGerald. “Circularity addresses the problem of increased consumption and disposal of limited resources. This technology is still in development for the process to work at scale, but there is exciting potential here for a large reduction in garments being sent to landfill, and the decreased use of virgin raw materials.” She encourages Primark to start looking into future options for implementing a circular economy, similar to the goal set by rival fast-fashion retailer H&M. The Carbon Trust Standard is the world'sleading independent certification of an organisation’s impact on the environment by verifying action on the three primary components of environmental sustainability: energy use and associated greenhouse gas (CO2e) emissions, water use and waste output. Project JUST is an open platform dedicated to informing and empowering consumers have the power to transform the fashion industry to an ethical and sustainable one with each purchase they make. The Sustainable Clothing Action Plan (SCAP) is a collaborative framework and voluntary commitment to achieve industry-led targets for reducing the use of resources in the apparel clothing. WRAP works together with governments, businesses and communities to offer practical solutions to improve resource efficiency to move to a sustainable, resource-efficient economy. The European Clothing Action Plan (ECAP) is a Life funded project supported by WRAP, which aims to reduce clothing waste across Europe and embed a circular economy approach. I:CO works with retailers to implement a take-back system in-store which makes it possible to collect used clothing and shoes at a store’s point-of-sale and give them a new life through re-use or recycling. Newlife Foundation is a registered UK charity which supports disabled and terminally ill children and their families. KIDS Fashion Delivers is a charity which donated new products to families in need across the US. The Red Cross is working across Europe to help the millions refugees and migrants displaced from conflicted areas such as Syria, Afghanistan, Iraq and Nigeria. Primark's restricted substance lists Product Restricted Substance List and Manufacturing Restricted Substance List. Greenpeace's Global Detox Campaign aims to elimate the use of hazardous chemicals from numerous industries, including the fashion industry to end toxic environmental pollution. The Sustainable Apparel Coalition is the apparel, footwear and home textile industry main alliance for sustainable production, whose main focus is creating the Higg Index, a standardized supply chain measurement tool for all industry participants to understand the environmental, social, labour impact of making and sell products. The Zero Discharge of Hazardous Chemicals (ZDHC) is a joint roadmap of brands committed to defining and developing a manufacturing restricted substances list for the fashion industry. The Partnership for Cleaner Textile (PaCT) is a partnership led by the International Finance Corporation (IFC) which drived the long-term competitiveness and environmental sustainability of the textile wet processing sector by addressing water, energy and chemical use. Primark’s focus on employee health and wellbeing extend well past its supply chain and into its stores. Ensuring its warehouse and store staff feel supported, well-trained and able to grow with its business into the future, remains another key focus for the value retailer. However Primark is also keen to educate its consumers as well as its employees, which is why it is in the process of renewing its website. Even though Primark does not have an online store, its global website 1 gets a significant number of visitors each month. “Our website will really be the platform that we use as our major communications tools with customers,” says Katharine Stewart, Primark’s Director of Ethical Trade & Environmental Sustainability. The website also features information on career possibilities at Primark, as well as a number of programmes and initiatives the value retailer has launched aimed at improving safety behaviours, employee wellbeing and working conditions in store. For example, Primark is working on improving its injury rate as part of its wider scheme to boost its safety performance, according to its Corporate Responsibility Report 2016. The value retailer states it is targeting efforts in certain countries where national safety standards differ from its own standards, but does not outline in detail which countries it is focusing on at the moment. However, Primark does ensure that all its workers undertake an online health and safety induction programme in their local language, at a time and pace which is suitable for them. The programme covers key issues workers should be aware of, such as health and safety responsibilities, hazard identification, and manual handling. In addition to the online course, Primark’s safety platform also includes additional information on safety topics, like office safety and emergency procedures. Primark also runs its Retail Manager Development Programme (RMDP), a bespoke supervisor development programme in the UK and northern Europe and is in the process of rolling it out to its other countries. In addition, Primark launched a wellbeing programme in its head office in Dublin in July 2015, which currently offers 20 classes a week in its own exercise studio. Primark also increased the number of fun, team-based projects with employees to boost direct engagement, which led to over 100 employees taking part in the wellbeing summer challenge. The retailer has also been expanding its ‘back of house’ environment in both new and existing stores to ensure store staff have a positive work space. As Primark has also expanded into new regions over the last few years, the retailer has ensured that all its new locations are supported by safety specialists who help uphold its safety standards. All senior members of staff have been trained to make sure safety culture and employee well being are embedded into role descriptions and that workers follow a thorough training programme before being allowed to work the shop floor. But how responsible are Primark’s in-store working conditions? But this training programme does not seem to be adequate enough in preparing staff for the the mental and physical demands needed for working in one of the busiest high street fashion chains in Europe. For example, a recent online survey from FNV 2, the Dutch Federation of Trade Unions, found that 75 percent of current and former Primark employees felt their workload was too high. The trade union previously opened an investigation into the working conditions at Primark in the Netherlands after store workers in Groningen filed numerous compliments concerning intimidation and heavy workloads. The survey, which was filled out by 1,186 employees across the Netherlands in February 2017, also saw 71 percent of respondents claim they faced difficulty when applying for holidays or days off. In addition, 66 percent of respondents also reported problems with calling in sick and 54 percent raised concerns with privacy. Employees argued that store managers used camera images to spy on them and played doctor by determining if they were too sick or not to work. “If you are momentarily in another place or talking to someone, then you are immediately asked/yelled on what you're doing,” wrote one employee from Primark’s Amsterdam location in the survey. “At times you are even threatened with a (written) warning." Primark opened it first store in Rotterdam, the Netherlands in 2008. Primark currently counts 16 stores across the country, including its flagship store in Amsterdam. Primark employs a total of approximately 4,800 workers in the Netherlands. In addition, 81 percent of respondents said they felt that Primark was missing a workers council who could negotiate agreements on their behalf concerning use of store cameras in relation to their privacy - even though the council is required by law in the Netherlands for any company with more than 50 employees. “The results are truly shocking. Primark governs with hard hard,” says Niels Suijker, union member at FNV in a statement. The value retailer said it was both “quite shocked and moved” by the results of FNV online survey and noted that it has been working for several months to launch its workers council. Since the survey’s results were published 3 Primark has met with FNV and agreed to make a number of changes to improve working conditions for staff, including respecting employee privacy, improved procedures for holiday leave, and the establishment of a workers council. However, even though Primark responded quickly to the allegations and was eager to improve conditions, FNV is aware time will show if working conditions improve and has therefore scheduled a meeting in three months time. However, store employees in the Netherlands who voiced these concerns are not only ones working at Primark who feel this way. Over in the UK and in the US, Primark sales assistants have also shared concerns feeling overworked and underpaid, having to deal with overbearing management teams, as well as difficulty in taking time off, on job boards Indeed and Glassdoor. These complaints from the UK have come even after Primark implemented the “national living wage” 4, which aims to ensure its workers are paid enough to live off of. In France, employees also complained of difficult working conditions in Primark, with complaints ranging from unpaid sick leave, to constant monitoring, to unexplainable gaps between sales assistants' wages 5. Over in Spain, in Madrid one Primark retail worker claimed he was making the same amount of money working 30 hours a week at Primark in 2016, as he was working 12 hours a week at department store El Corte Inglés in 2007 6. So even though Primark may have a number of initiatives in place aimed at improving employee wellbeing, it seems as if the effects of these programmes are not as beneficial or effective for all its workers - in particular its store employees. Should Primark be more open with consumers concerning sustainability? At the moment Primark does have a few initiatives in place aimed at educating consumers on how to care better for their clothes, such as their partnership with SCAP 8. But in order to properly tackle many consumers perception and predisposed disposition against Primark and its products, the value fashion retailer may have to dig a little deeper. Primark does agree that it could be sharing more information on its sustainable and ethical practices with the public, even if consumers are not always asking for it. “It’s a bit like the chicken and egg conundrum isn’t it?,” says Stewart on sharing more on their corporate responsibility practices. “I think that the information has to be there for the consumer to make an educated choice. But if it isn’t available, then consumers should also be proactively asking why not, and what retailers are doing on certain subjects. We do get many queries concerning our sustainable practices and we do answer those as best we can.” Primark even has a FAQs section on its website under its ‘Ethics’ section which answers it's most commonly asked questions. Does Primark’s Low Prices equal Low Quality and Disposable Fashion? Unsurprisingly Primark’s low prices are one of the main things which gain the value retailer the most attention - both good and bad. While it’s affordable and accessible price point is undoubtedly one of retailer’s driving factors, it is also one of the main reasons why the brand is often thought of as unsustainable and unethical. Primark’s prices are so low, that they pushed Belgian MEP to the European Parliament Marc Tarabella to request the European Commission to investigate the brands working conditions and pricing scale. “The Irish giant Primark is known for its ultra-low prices, but also for the working conditions at its suppliers' factories. Many people wonder about their prices, which are up to five times lower than those of the competition. Primark has always responded by saying that it is it's competitors who are charging inflated prices,” 9 wrote Tarabella in his request in 2015, which was ultimately dismissed by the EU Parliament. Consumers still ask how t-shirt which retails for 2 pounds can be made in a fair and honest way. Some argue that it is precisely because Primark’s clothing is so cheaply made and in such excess that is has contributed to the idea that fast-fashion disposable, something to throw away after a few wears. Unfortunately cheaper prices are also more likely to trigger consumers into making an impulse purchase in store. And thanks to Primark’s low prices shoppers can easily fill a recycled paper bag full of garments for 50 pounds or less. But this also means consumers are more tempted to buy something without trying it and will be less inclined to return an ill-fitting garment, as it could cost them more in travel costs going back to the store than the actual garment itself. “It is hard to resist the allure of a good bargain, but fast fashion means we’re consuming and trashing fashion at a higher rate than our planet can handle,” warns Kirsten Brodde, head of Greenpeace’s Detox My Fashion campaign 11 in a statement. What is Primark doing to offer affordable fashion at an amazing price? So what is Primark doing to reassure its consumers that its products should be cherished and that people should not buy more than they need? On its website, the value retailer has a dedicated area under its ‘Ethics’ page which explains how they are able to offer the lowest prices on the high street. For example Primark claims to not spend any money advertising and orders its products in large volumes well in advance, so they can keep their overhead costs as low as possible. Primark’s margins are also said to half a high as those of its fast-fashion competitors. Primark also ensures its suppliers use a streamlined production process to make its clothing in the most effective way possible. Combined, these tactics are said to ensure Primark remains accessible and affordable to all shoppers, while offer good value for money - a goal the company has always kept in sight, according to Primark’s Director of Ethical Trade & Environmental Sustainability. “Unlike other clothes shops, people often come to Primark because they know they’ll be able to afford a whole outfit. This means we get the savings from buying in bulk,” explains Stewart. Nevertheless, Primark cannot argue with the fact that many consumers do shop excessively at Primark and are more likely to make an unnecessary, or unneeded purchase if the price is low enough. The rise of ‘haul’ style shopping videos on YouTube is just one example of how the value retailer’s pricing is affecting the way people shop and how they view their products. A quick Google search shows exactly how fast Primark haul videos are growing in popularity - with 3.63 million results showing up for ‘Primark haul 2017’ versus 2.95 million hits for ‘Primark haul 2016.’ Many of these videos attract millions of views - for instance YouTube favourite Zoella’s latest ‘Primark Haul’, entitled ‘The Biggest Primark Haul I've Ever Done’, was uploaded on March 21, 2017 and already counts over 2.6 millions views. The 20-minute video features numerous items from Primark’s Spring/Summer 2017 collection including boyfriend style jeans, striped cropped tops and lacy triangle bras - all in several colours and sizes. In the video Zoella shows off each item one by one to her viewers: young, impressionable women who all want to look and dress just like her - which leads to many of them also shopping in bulk at Primark. Primark has been grappling with the best way to tackle this assumption over the past few years. One key avenue Primark has been experimenting with to better communicate their ethics to consumers is video. But what could Primark film to convey its good ethics in simple and clear way? It’s suppliers factories. "We made a 360 degree video of one of suppliers factories in Bangladesh,” says Stewart. The video, which marks a first for the value retailer, shows what factory conditions are like for workers in Bangladesh. “It's really interesting and been very helpful for when we have been giving school talks or teaching at colleges,” adds Stewart. “I just think it’s incredibly insightful because it follows the lifecycle of a product, from the cutting room all the way through the factory floor.” Primark has shared the video on their website, under their ‘Ethics’ section as consumers often requested what a supplier factory from the value retailer looks like. “Historically we have always shared still photographs of the factories we work with, but we thought it would be good to bring it to life in another way. Now with the younger generation becoming increasingly technical and visual, we felt that 360 degree video was the right format to do that in," explains Stewart. Depending on how consumers respond to the video, Primark may consider creating more - but for now the value retailer is pleased with their first 360 degree video. This is Primark's first 360 degree video. It is a virtual tour. When watching the video via a desktop computer, or laptop, please use your mouse to virtually 'look' around the space. When watching the video via a smartphone, the direction of the video will shift depending on the position of the phone - in order to view the full 360 degrees in the video, please physically rotate your smartphone around. The FNV, is the largest trade union in the Netherlands and counts over a million members across numerous sectors. FNV Primark results from its online survey into the working conditions at Primark NL. The National Living Wage ratesis applicable to workers aged 25 or more, the national minimum wage is applicable for workers aged 24 and under in the UK. Rates change every April. Referenced from: 'Enquête – L’enfer Primark' - October, 2016. Referenced from: 'No es solo Primark: así tratan (y así pagan) a sus dependientes en H&M, Inditex y Mango' - November, 2015. MEP Marc Tarabella written question to the European Commission to investigate Primark's working conditions. Secondary Materials and Recycled Textiles (SMART) and the Textile Recycling Association joint statement on garment recycling. Photo: Amsterdam Flagshipstore. Credit: FashionUnited. Photo: Primark Employees at Primark Den Haag. Credit: Simon Trel for FashionUnited. Video: PRIMARK | Take a 360 virtual tour of a factory in Bangladesh. Credit: Primark. Can Primark really offer responsible fashion at an amazing price? Some may think the Rana Plaza factory collapse 2013 was a turning point for the fashion industry - a wake up call for the retailers producing their garments there to band together to make a change for good. However for others, like Primark, it was a call to take a closer look at its supply chain and operations to see where it could make even a larger impact through its sustainable and ethical initiatives. For years Primark has been fighting against the stigma that cheap fashion is not sustainable or ethical, even though the value fashion retailer shares 98 percent of its suppliers and factories with other high street retailers, such as H&M, Zara and Mango. Publishing more information on its website, training its members of staff and creating behind the scenes videos of the factories it works with, are just a handful of avenues Primark has taken on share what it does in terms of sustainability and social responsibility. And the value retailer’s efforts have not gone completely unnoticed within the industry. “It is commendable that fast fashion companies are reacting to the challenges we face and creating positive intervention towards socially mindful solutions. In the case of Primark, and others, I dare say, it's about time,” says Orsola de Castro, Founder and Creative Director at Fashion Revolution 2 and Esthetica. However, although fast-fashion retailers like Primark have been working hard to improve working conditions and dramatically decrease their impact on the environment, in reality they have been unable to match their sales gains with corresponding improvements in terms of the social and environmental aspects. At the end of the day, the fashion industry remains one of the most polluting sectors in the world. The social, sustainable and ethical impacts of the industry - both good and bad - continue to grow as the number of garments produced does. Since the global emergence of fast-fashion retailers like Primark back in 2000, the number of garments produced annually has doubled, exceeding 100 billion garments in 2014 - which is equal to nearly 14 items of clothing for every person on earth according to data from McKinsey & Company 3. With limited resources for apparel production, there is only so much retailers like Primark can due to limit the negative impacts of its current business model. The value fashion retailer’s parent company, Associated British Foods, acknowledges it faces pressure to set itself fixed goals in terms of responsible and sustainable production, but stresses transparency is key to making a real difference. The premises for this in-depth case study came around after an interview with Katharine Stewart, Primark’s Director of Ethical Trade & Environmental Sustainability, when it became clear to me that this was an area which touched on a number of relevant issues within the fashion industry. I believe that incorporating sustainability as driving factor within the global fashion industry is vital to ensure its future survival, but unfortunately it seems to remain an effusively difficult area for many retailers, designers and brands to grasp. For many companies within the industry producing responsible fashion is becoming more and more important, but it is still not their majority number one priority. This long-read article aims to touch on all the points mentioned above and encourage industry insiders to rethink their views on social responsibility in general, as well as their opinions on Primark. Following my interview with Stewart, I reached out to numerous organizations to learn more about their thoughts on Primark’s current stance concerning their sustainable and ethical initiatives and would like to thank the Clean Clothing Campaign and their Dutch brand ‘De Schone Kleren Campagne’, Project Just, the Fair Wear Foundation, Fashion Revolution and Greenpeace for their help and contributions to the piece. I would also like to thank Primark for sharing more information on their sustainable and ethical initiatives, in particular Katharine Stewart. A list of Primark’s social, environmental and sustainable partners. Fashion Revolution is a global movement started in the wake of Rana Plaza. Fashion Revolutions aims to bring everyone involved in the fashion supply chain together to bring around positive change and create a more sustainable future. Data from ’Style that’s sustainable: A new fast-fashion formula’ by Nathalie Remy, Eveline Speelman, and Steven Swartz, McKinsey & Company, October 2016. Photo: Leipzig - Germany. Credit: Primark.